Suppressing emotions may be a socially-approved way to show you are not a ‘cry baby,’ but it may cause these 7 negative things to happen that can affect your mental and physical health. Human beings share the capacity for emotion, which enhances our ability to relate to one another on a deep level. Expressing emotions in a socially healthy way helps you to connect to others, establish relationships, work cooperatively, and be a courteous, productive, and positive member of your social network. 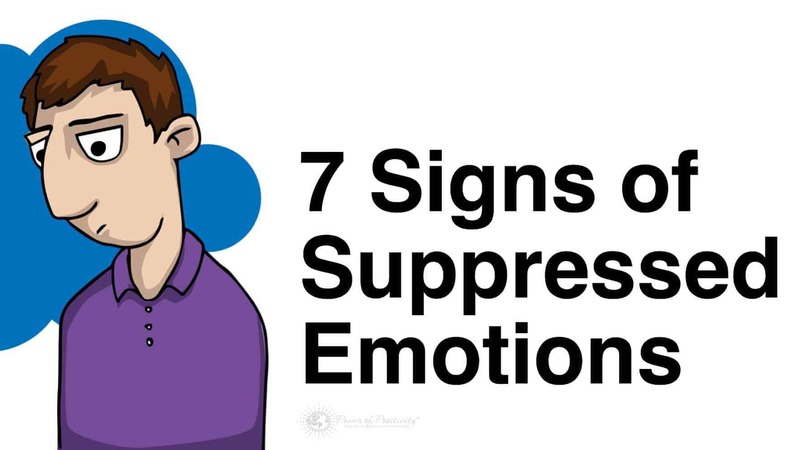 Let’s look at 7 negative things that happen to you when you suppress emotions, as well as some ways to express them in positive ways. Suppressing the emotions of sadness, anger or fear is unfortunately a symptom of depression. People who feel pressure to hide how they feel are like an appliance that has had its cord cut. They have no connection to the outlet, so they can’t receive energy and use it to accomplish a task. Does emotional expression prevent depression? Researchers are unsure of all of the factors related to depression, but this could be one of them. Women express their emotions and have the freedom to discuss feelings whereas men feel societal pressure to hide emotional displays. Sleep disturbances like insomnia, tossing and turning, and restless dreams can be a sign of suppressed emotions. Your brain is trying to work out the details of the psychological problem that you are dealing with, but you are forcing it to do so without your help. When your significant other can’t tell if you’re happy, sad, angry, or afraid, it can keep them on edge. They may respond with anger at your lack of emotion. A healthy relationship requires the expression of the emotions of love, care, concern. In our article 7 Things You Deserve In A Relationship you may recall that unconditional love is something you should be able to expect in a relationship. A study in the journal Personality and Social Psychology Bulletin found that ‘Suppressing emotions was associated with emotional costs for the partner discussing his or her sacrifice.’ This means that not being able to talk about emotions that came up when one partner made a sacrifice in the relationship resulted in poor emotional health for the one who made the adjustment. The researchers also found that increases in emotional suppression was associated with decreases in emotional well-being and relationship quality as reported by both partners. The emotional suppression was also associated with thoughts about breaking up with a romantic partner. Hopefully your manager allows you to express your emotions about changes that impact you at work, otherwise, you may experience significant workplace unhappiness. When workers suppress emotions at work, they feel less committed to the work, have elevated stress levels, higher heart rates, higher levels of anxiety, and experience overall less psychological well-being than workers who have opportunities to vent frustrations. Suppressing emotions takes up mental energy, so you may find yourself tired more often than usual. Another common sign of suppressed emotions is mental fatigue, brain fog, or distracted thinking. If you’re having frequent ‘brain farts,’ then check yourself for suppressed emotions. Ask yourself if you may have any repressed anger, fear or sadness that you haven’t been dealing with. Try writing down your feelings, talking to a trusted friend about it or seek a licensed counselor to work through it. You can find counselors online, through text crisis lines and in person. There are even counseling apps that you can use to track your emotions. Bottling up emotions can lead you to feel even stronger emotions. For example, if you are repressing sadness and another sad event happens, your response is likely to be stronger than it would have been without the additional hidden emotion. Suppressing emotions by changing facial expressions and body language is a type of deception. Perceptive people and empaths can pick up on something being wrong when others are hiding emotional responses. This can keep people from connecting with you on a personal level. When we become aware of deception in others, like hidden emotions, we become fearful of other things that the person could be hiding from us. People who suppress emotions are unlikely.